Last month, we had my ideal meeting: History. Clothes. Women. REAL historical bags. On arrival, our speaker, Meridith Towne proceeded to unpack a history lover’s dream from her boxes. Edwardian dresses were placed onto dummies, fur trimmed boots worn by a real Edwardian woman were carefully set onto the table. Beautiful beaded bags and purses glimmered as if they were only made yesterday. I knew it was going to be a fascinating talk from the start. Meridith brimmed with enthusiasm about her subject and her collection of original items was astounding. I love a good talk with real objects to see and touch – it’s what history is about. At the beginning of the meeting we also had an extra treat. 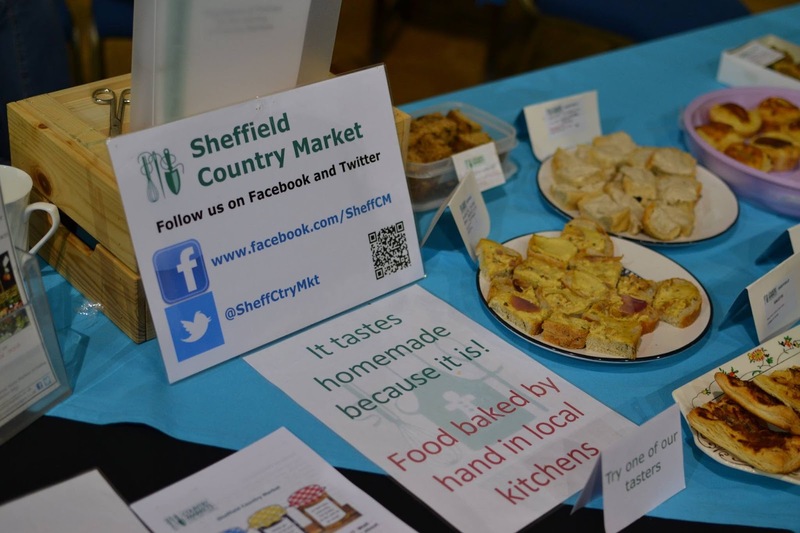 The Sheffield Country Market ladies (including the one and only Nora Tebbutt …. recognise the surname?…) had brought us a range of sweet and savoury treats to try and taste. I particularly enjoyed the breads and pates. However, after having a Street Food Chef quesadilla before the meeting, my stomach didn’t agree….. The ladies then gave us a talk about how the markets had originally been linked to the WI alongside some information about what they do and why. It was a lovely overview and hopefully got some of our members to either go and buy from them on a Saturday morning or to join in and sell their own wares! After the usual info swap and Laura’s usual comedy routine (seriously, this girl should go into stand up) we prepared for the talk we had all been waiting for. Meridith didn’t disappoint. Gliding into the room in her full Edwardian shopping outfit, we all gasped. She introduced us to exactly what Edwardian middle class women would have experienced if they had had the extra cash to roam the new department stores of the day such as Harrods and Selfridges. From gloves to French underwear which you wouldn’t tell your mum about (oo-er!) 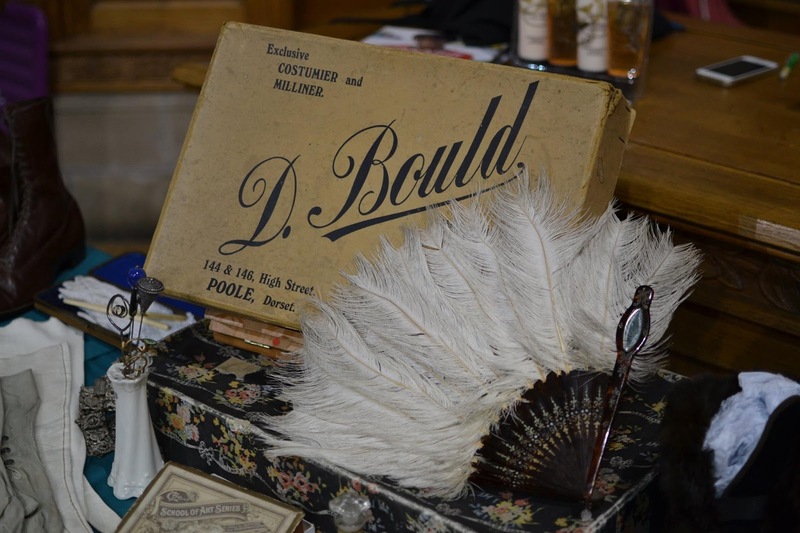 the story of the Edwardian shopaholic was a fascinating one. 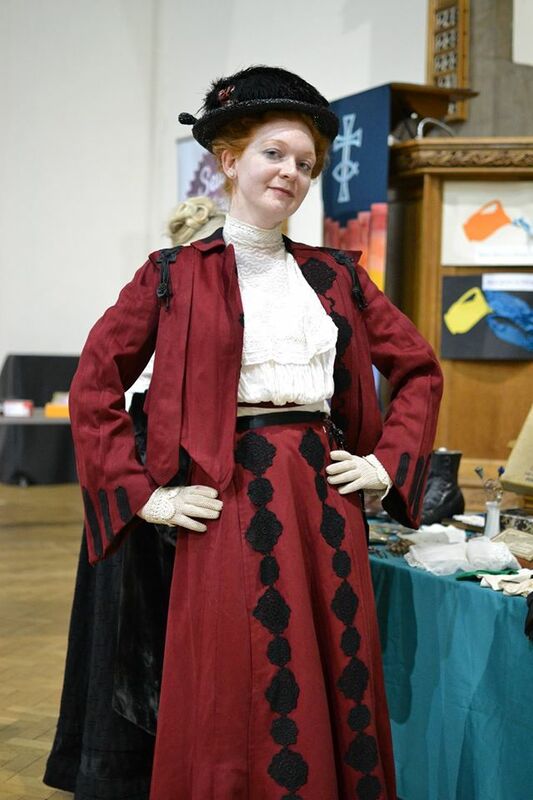 As well as being able to look at the original pieces of fashion in Meridith’s collection, we found out some amazing facts about women during the period. The ones that particularly stuck with me included the fact that there had not been women’s toilets in shopping stores previously as women ‘didn’t do that’. Also the dark detail (I like a bit of horrible history!) that a women would buy a shroud to go in her wedding trousseau. Because this was frequently needed due to the high rate of death through childbirth. It was just something that you had to prepare for! At the end of the evening, ladies were allowed to look at and handle the original objects, connecting them to the women of foregone times. A truly fascinating and insightful experience from an unusual and enthusiastic speaker.